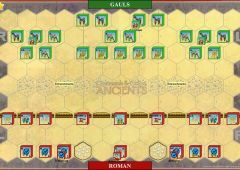 Gaius Julius Caesar, an ambitious Roman noble, had entered into a political alliance with Gnaeus Pompey and Marcus Licinius Crassus, which became known as the “First Triumvirate.” Caesar used these connections to obtain an appointment as proconsul for Gaul. 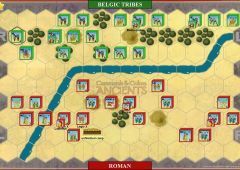 As Caesar arrived to govern his province, the Helvetii were migrating from what is now Switzerland into Gaul to find new lands. 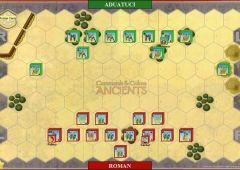 Caesar surprised and defeated one detachment of the Helvetii. 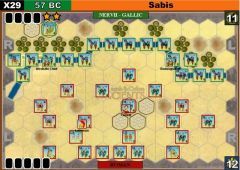 He then doggedly followed but avoided conflict with the main body, as he was badly outnumbered by the barbarians and needed to find an advantageous position for a decisive battle. 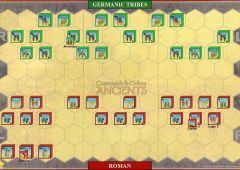 After a fortnight, Roman supplies were running short and Caesar fell back toward Bibracte to replenish. 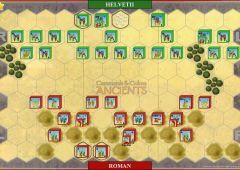 The Helvetii followed and formed for battle against the Romans. 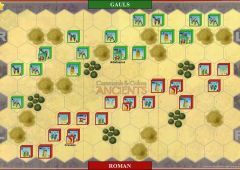 Caesar withdrew and formed his six legions on a nearby range of hills – his four veteran legions in front, and his two newly raised legions in the rear. 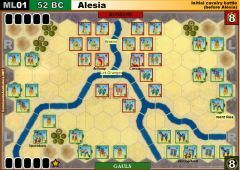 The Helvetii charged forward and were met by a shower of pila. 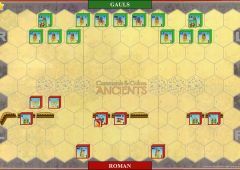 The Romans then counter charged downhill with swords drawn. 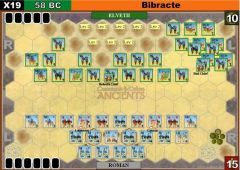 The disorganized barbarians started to fall back when allied Boii and Tulingi tribesmen marched forward and gave the retiring Helvetii the heart to continue. 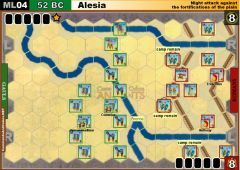 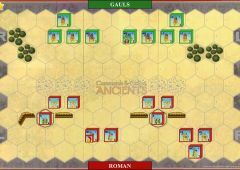 Caesar again led his legions forward against the combined tribes, and they fled in disorder back to their camp. 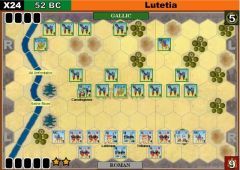 During the night Caesar attacked the enemy camp and completed the rout. 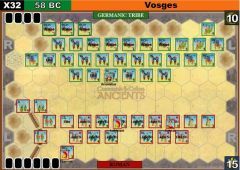 The next day, envoys from the tribes offered to surrender and Caesar ordered them to return to their own lands, knowing that if their former country were left unpopulated, hostile Germanic tribes would fill the vacuum. 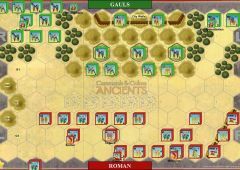 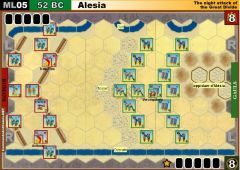 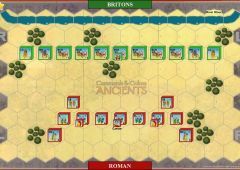 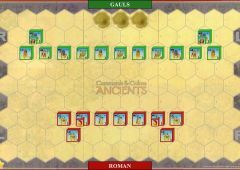 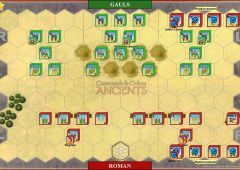 • The two Roman auxilia units in the Roman camp hexes represent the new recruits ordered to stay behind. 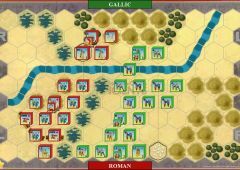 These units cannot move or advance out of those hexes. 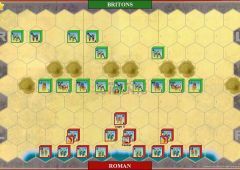 They may, however, engage in ranged combat, close combat or battle back when attacked. 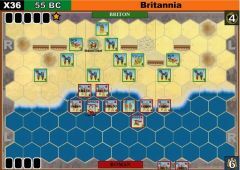 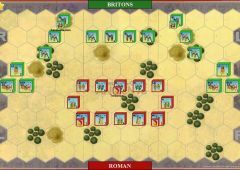 • When a friendly unit occupies an enemy camp hex at the start of that player’s turn, the player gains one Victory Banner that cannot be lost. 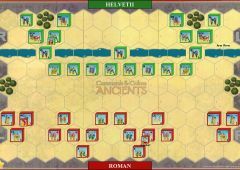 Remove the camp terrain tile hex and collect the Victory Banner before playing a Command card.